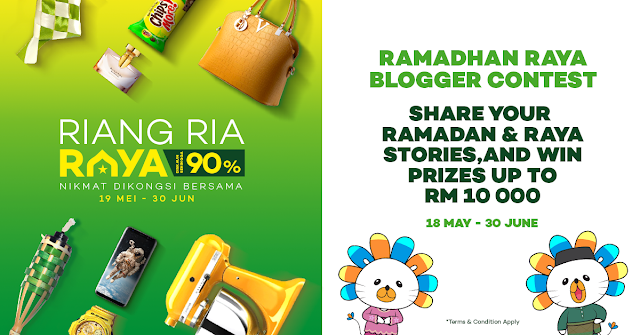 Lazada Ramadhan Raya Blogger Contest. Ada yang dah join ke contest yang dijalankan oleh Lazada? Hanya tinggal beberapa hari sahaja lagi. Baca maklumat di bawah untuk menyertai contest ini. 2. During these 4 weeks, there will be 1 contest held every week with a different theme (in totality there will be 4 contests held during these 4 weeks). Every contestant may participate in more than one contest. a. How are you decorating your house to be Raya ready? c. What kind of products (e.g., furniture) can you get on Lazada’s platform to help you decorate your house for this Raya? 3. Week Three Contest: //HAPPENING NOW! a. What's your color theme for this Raya? c. What outfit/clothes would you like to buy on Lazada’s platform for this Raya? a. Where do you celebrate Raya this year? b. List down your "balik kampung" essentials. c. What would you like to buy on Lazada’s platform to bring along for "balik kampung"? 4. Contestants need to mention Marhaban Ya Ramadhan and Riang Ria Raya sale (http://www.lazada.com.my/riang-ria-raya/)that will take place from May 19 to 30 June (where you can find special discounts up to 90%!). Good news! Every week, we will select 3 lucky bloggers to win RM100 shopping voucher each at Lazada. Invite your blogger friends to join this contest, so you will increase your chance of winning! The more the merrier! 1. The winners will be notified on 3 July 2017 via e-mail (“Notification”). The Notification will contain instructions on how to claim the prize, which should occur within three business days from the date of the Notification. We may opt to announce the results of the contest in our social media page and/or other platforms owned and operated by us..
2. Contestants must be legal residents of Malaysia aged 18 years and above as of the first day of the contest and must operate a blog. 3. If any winner (or any substitute winner) is or becomes ineligible, cannot be reached, or fails to claim the Prize within seven (7) days of receiving the Notification, the prize will be forfeited and Lazada will select a substituted winner. If, having attempted to contact a winner and a substitute winner, Lazada is unable to award a prize, Lazada reserves the right to consider the prize unclaimed. 4. Contestants shall only submit original materials and warrant that the content of their submission do not infringe any third party’s intellectual property rights. 5. Any entries containing third party intellectual property rights that are used without prior consent from the rights holder, or are abusive, inappropriate, offensive or contain obscene language or imagery will be disqualified. Examples of language/images considered to be inappropriate, offensive or obscene, include (but are not limited to): any message/image which contains (a) swearing; (b) comments or actions which appear to be discriminatory of any person, company or group of individuals, for example comments of a racist, sexist or homophobic nature; (c) sexual innuendo, sexual language or sexual acts, actions or gestures; (d) promoting any illegal unlawful activity such as drug use; (e) any message/image that appears to be an advertisement or solicitation to buy; and (f) any materials (whether written or visual) that directly or indirectly relate to Lazada Malaysia competitors or that show any intention of promoting any brand other than Lazada Malaysia. 6. By participating in this contest, Contestants grant Lazada Malaysia and its partners and affiliates an irrevocable, royalty free, perpetual, license to use their Articles (including all copyrighted material contained therein) and/or to feature them in any advert or promotional material as well as the right to use their personal data for the purposes of this auction or for marketing purposes. Contestants further agree to release Lazada Malaysia from any liability whatsoever related the contest, unless any damage they have suffered is the direct result of Lazada Malaysia's fraud or willful misconduct. 7. Lazada Malaysia reserves the right to change, suspend or alter the terms and conditions of the contest, or terminate the contest, at any time and for any reason. 8. Lazada Malaysia’s decisions on all matters relating to this contest are final and binding and no correspondence will be entertained. a) By participating in this contest, all contestants consent to allow Lazada Malaysia to process and disclose to any third party, all personal data of the contestants provided by the contestants pursuant to this contest for any and all purposes relating to this contest and any and all other activity relating to or arising from the course of business or businesses of Lazada Malaysia including, without limitation for the running of this contest and or any event or publicity of the contest in any form or through any media without additional compensation, notification or permission.